Much like most multi-sports clubs best known for their football sections, SL Benfica are enormously successful. Their numbers speak for themselves: other than winning a record 34 Primeira Liga titles and 25 Taça de Portugal trophies, they have also claimed two consecutive European Cups in 1961 and 1962. Thanks to their reputation of a working-class team, Benfica are by far the most popular Portuguese club, both in the country and worldwide. Along with the two other members of the Portuguese "Big Three" – Porto and Sporting – Benfica have never been relegated from the top flight. 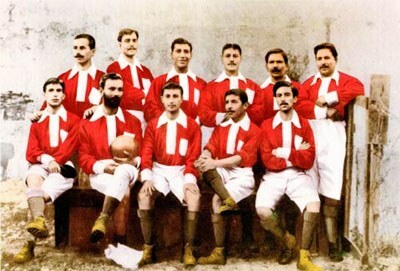 The first Benfica team from 1904. The club was founded in 1904, under the name of Sport Lisboa; the same year, they merged with Grupo Sport Benfica and changed their name to Sport Lisboa e Benfica. Shortly after the Portuguese league was officially formed in 1934, Benfica emerged as its most dominant team, clinching three consecutive titles from 1936 to 1938. By the end of the 50s, their trophy cabinet was home to 9 Primeira Liga titles and 10 Taça de Portugal trophies. Benfica plays against Club Sport Marítimo 1936. It was, however, in the 60s where Benfica started making a name for itself on the European stage. Led by the incredible Eusébio, Benfica were the first team to halt Real Madrid's streak of five consecutive European Cup victories, claiming the trophy for themselves in 1961. They repeated as champions the following year, while also making three more finals throughout the decade. Domestically, Benfica destroyed the opposition and stormed to 8 Primeira Ligas and 3 Taça de Portugals by the end of the decade. In 1965, Eusébio made history by becoming the only player to win a Ballon d'Or while playing for a Portuguese club. The following two decades saw Porto and Sporting mature into contenders, but Benfica remained the number one club in the country. In the period from 1970 to 1996, Benfica claimed 13 Primeira Liga titles and 10 Taça de Portugal trophies. At the same time, further European success was proving elusive, even after the club made a huge financial push towards the end of the 80s. While that did result in two European Cup finals (1988 and 1990), PSV Eindhoven and AC Milan would eventually prove too strong. The rampant spending finally caught up with the club in the mid-90s. The financial crisis that followed saw Benfica drop off the map for a while, and the club ended the century with a couple of disappointing mid-table finishes. After a drought that lasted eight years, the club finally won their 24th Taça de Portugal by defeating Porto in the final. Since then, Benfica have claimed an additional four Primeira Liga titles and one Taça de Portugal trophy, cementing their return to the big stage. In thes 2013-2014 season Benfica won the "Treble", including Primeira Liga, Taça de Portugal and Taça da Liga (the latter founded as late as in 2007), for the first time. 1904 The club is established (as Sport Lisboa). 1904 Sport Lisboa merge with Grupo Sport Benfica and change name to Sport Lisboa e Benfica. 1925 The club move to their first own stadium, Estádio das Amoreiras. 1936 First time national league champions. 1940 First time Taça de Portugal champions. 1954 The club move to the Estádio da Luz stadium. 1961 Eusebio play his first season for the team. 1961 Become the first team in Portugal to win the European Cup. 1971 Winning their first Double (Primeira Liga and Taça de Portugal). 1973 The club become the first ever to win the top national league without defeat (28 wins and 2 draws). 1981 Winning their first Treble (Primeira Liga, Taça de Portugal and Supertaça Cândido de Oliveira). 2003 The club move to the new Estádio da Luz stadium. 2009 First time Taça da Liga champions.